Following up on yesterday's Pro Fight of the Year nod to Robert Washington and Zach Freeman, the votes fell in favor for Fight Hard MMA again, this time on the amateur side. Washington and Freeman sat the bar pretty high with their memorable clash but in July a match-up of two of the area's top amateur bantamweights: Ira Lukowsky and Damian Newman, reached if not eclipsed it. It was a balmy night that featured a well-trained machine taking on a scrappy kid with a truckload of heart. "It was like Joker vs. Batman and the fans love that no matter what the sport," Fight Hard MMA president Kenny Nowling said. "Damian proved, with his personality and the way he fought, to be the hero and Ira liked being the villain. But they are both such good guys in and out of the cage." 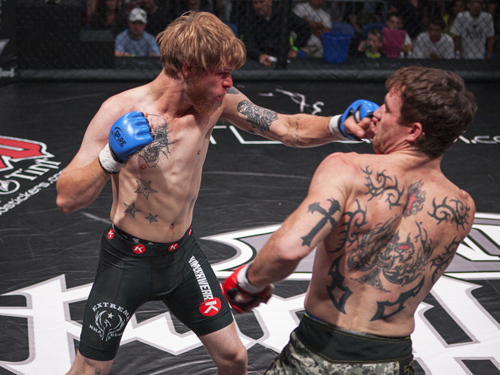 Lukowsky brought to the cage a strong ground game forged in the wrestling room at Lindenwood University-Belleville, dangerous hands (as evident of his 2010 golden gloves championship_, and the No. 1 bantamweight ranking after a victory over Fierce Taylor. Newman had fought Taylor twice resulting a loss and a draw. 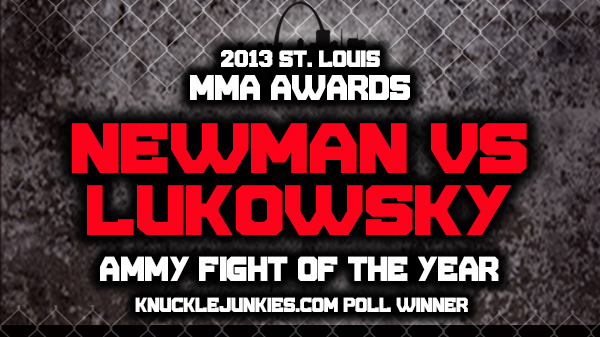 Newman's wild striking, and incredible slippery ground game would be an interesting style clash with Lukowsky. "That fight just looked so enticing on paper." Nowling said. "Those guys had a genuine dislike for each other after. You didn't have to be Nostradamus to know that was going to be a barnburner." In the first round, Lukowsky continued to pop Newman's bushy, red-haired head back and landed an effective and strong jab. 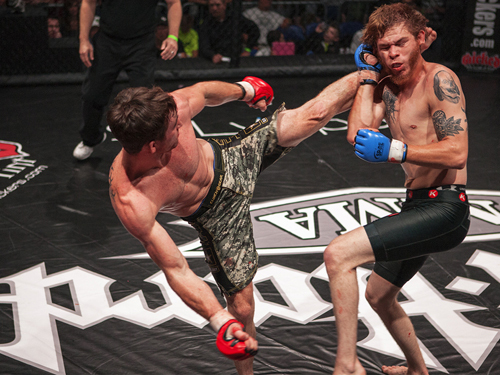 Lukowsky mixed up his striking throwing stiff kicks to the body that seemed to throw Newman off his game. Lukowksy bloodied Newman's nose midway through the first round before landing three power shots that Newman somehow absorbed, shook off and eventually worked a takedown. In a near "Rocky" moment, Newman came back strong to close the first round and had Lukowsky in legitimate trouble. Both fighters ended the round bloodied and battered. Round two saw a more fluid and composed Newman as he was able to better gauge distance. Lukowsky got docked a point for holding onto the fence. When Newman was eventually able to get the fight to the ground, Lukowsky spent the better part of the round cinched in Newman's body triangle. Newman worked an armbar late, and it nearly cost him the fight as Lukowsky rained down several punches to close it out. The third saw Lukowsky get Newman to the floor but Newman kept it active on the bottom, peppering with punches. Newman attempted an arm bar but then eventually pulled down the triangle to get the submission. "This fight showed that Damian has unbelievable heart." Steve Berger, Newman's coach, said. "It doesn't matter how hard you hit him, no matter how hard you try and out wrestle him. He's just going to keep coming and coming until he gets you." "I think the fight speaks for itself. I would love to see a rematch before Damian goes pro." Nowling said. "In 25 years we might see three or four fights that will be an epic battle like this one was." "I remember thinking, wow this is a pay-per-view fight." Berger said. "It was tons of actions. Ira was very very tough. Damian won the fight but he was definitely tested every second of that fight. 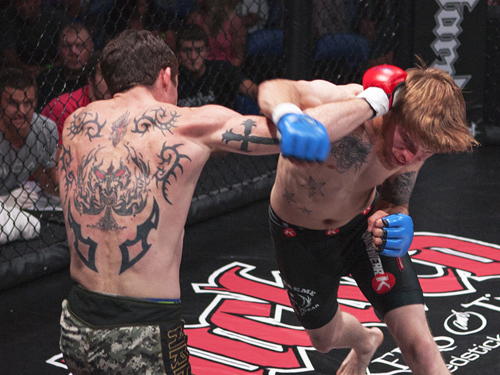 Ira was in that fight up until Damian caught him, and it was a good showing for both fighters." 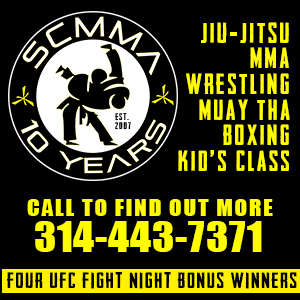 Newman would go on to have one more amateur fight, to cap off the year with a perfect 5-0 record. Lukowsky hasn't competed since this bout.